Azamara Quest offers a great, small ship experience, with individual, unique events that add to the enrichment of the immersive experience. Great service, great food and wonderful ports of call, combined with a desire to correct any issues whilst onboard, make Azamara one of the best to cruise with. 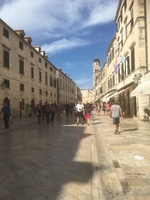 Venice, Kotor, Ravenna, Hvar, Dubrovnik and Koper, were all ports worthy of a visit, and with the Azamazing Evening in Koper, made the cruise memorable. PerpetuumJazille were a wonderful a Capella group and the highlight of the cruise entertainment. The stateroom we booked was an outside and was all we could have expected. Smallish but sufficient, the bathroom contains just enough space to meet its intended functions. Bars and restaurants provide quality offerings with speedy service and a great “can do” approach. Two tender ports posed no problems as the service was slick and uneventful. Being docked in Venice overnight offer a reprieve from the high cost associated with eating and drinking in the overpriced areas whilst still offering the chance to see all the sights that Venice is known for. A walking and gondola tour by Viator proved to be a “must do” event. However, our EasyJet flight was cancelled 21 hours before we were scheduled to return home and our travel agent managed to get us a flight to get us back to LHR instead of LGW but we had to spend 10 hours at the airport for this flight, with a promise of reimbursement of the taxi fare when we submitted a valid receipt to them. Be aware that tenders use the lifeboat outside your window and can frighten both you and the men getting the lifeboat ready for tender?? ?